The Brexit fallout won't be limited to just the U.K. Other European institutions, like Deutsche Bank, are in the cross-hairs too. In 1992, George Soros gained famed when he notoriously "broke the Bank of England" through his massive short trades against the pound on the currency markets. Nearly 25 years later, this billionaire is once again seeking to profit on volatility across the pond. Following the U.K. vote to leave the European Union, German regulatory filings show that Soros has bet over $100 million that the "Brexit" fallout will cross the channel to continental Europe and pummel the beleaguered German institution Deutsche Bank (NYSE:DB). Soros predicted the U.K. would remain. That was obviously wrong. Prior to the vote, Soros had his money positioned for a "remain" victory at the polls. He had long positions in the pound, betting that a vote to "remain" would cause the currency to strengthen. However, when news broke that the U.K. had voted to "exit," the pound's value dropped dramatically, reaching lows not seen for 30 years. The chart below shows the exchange rate between the U.S. dollar and the pound. 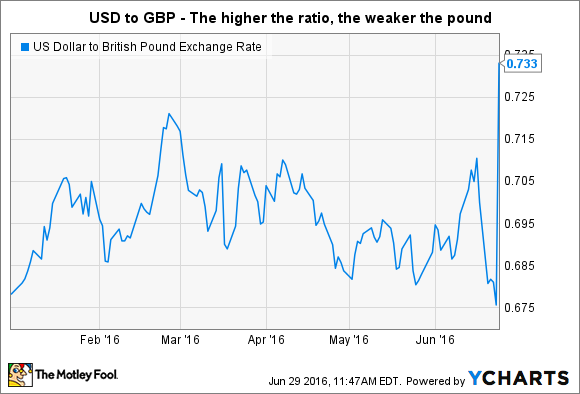 The higher the exchange rate on this chart, the weaker the pound and, conversely, the stronger the dollar. Soros, who has an estimated net worth of $23 billion, is not the type to sit idly as the market moves against his bets. Instead, he responds to changes in conditions by changing his bets. On Friday, as the markets imploded on the results of the Brexit vote, Soros took a significant short position in Deutsche Bank. According the regulatory filings, Soros is short over 7 million shares, worth about $100 million when he made the bet. A short position is when an investor borrows shares of the stock and sells them, hoping to buy them back in the future when the stock trades at a lower price. Deutsche Bank has been one of the worst performing financial stocks in the world over the past few years, dropping 75% over the past five years. Investors have punished the bank for its high cost structure, weak earnings, and below-peer capital base. The macroeconomic headwinds in the Eurozone have only flamed the fire. The bank trades today at just 0.26 times its book value, a level far below any of its European or American competitors. The biggest losers following the Brexit results, dropping far more than even Deutsche Bank, were U.K. based financial institutions. British bank Barclay's PLC (NYSE:BCS) dropped over 21% on the Friday of the vote. London exchanges halted trading of Barclays and fellow U.K. bank RBS (NYSE:RBS) stock on Monday in an effort to calm the panicked selling. 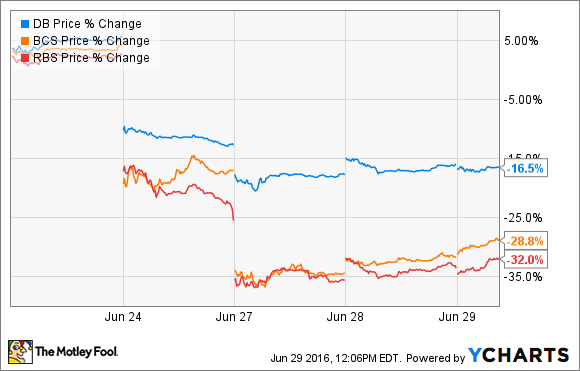 By the following Wednesday, Barclays' shares had fallen more than 29%. RBS was even worse, down 32%. By comparison, Deutsche Bank's 16.5% drop almost looks modest. It's not yet known what other positions Soros has entered or exited since the Brexit chaos started. The position in Deutsche Bank is only known because of a required regulatory filing in Germany. It seems likely that his short positions could include other European financials, though we don't know for sure. We also don't know if and when he exited his long bets on the pound. However, what is clear is that short term traders and hedge fund managers are never married to their ideas. Soros and others like him make calculated bets with a thorough understanding of the risks and contingencies. When the market proves their ideas wrong, they are quick to adapt. In this way, it almost doesn't matter if Soros is right or wrong. It only matters if he makes money.